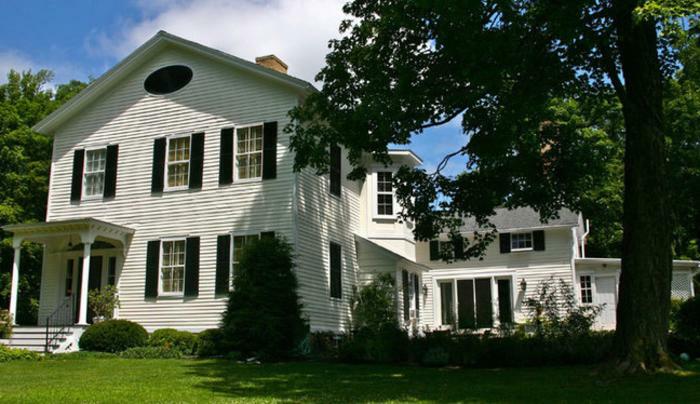 A true gem in Skaneateles, the Benjamin Porter House is located in the heart of Skaneateles and is a short walk to the lake, shopping, restaurants, and all the charms a small village has to offer. The home is surrounded by tall maple trees, a stream that meanders around the property and a pond. A brick patio and fountain sit gently near manicured gardens which offer tranquility and beauty. Tastefully appointed large rooms with ten-foot ceilings, four-poster king size beds, private baths and fine linens greet you during your stay. There are five fireplaces made from wood, marble, and brick are present throughout the house. Features also include original oil paintings reflective of the town's grace.